The mammals in this house have been sharing shelter with insects. Finding moths in January reminds me of fall days when it was mild enough to leave the doors open. Moths came in then–I would find them resting on window glass morning and evening. And why would they not stay in, finding shelter? I swear I never noticed them during dark November and December. Perhaps they were hiding behind picture frames or between books on the shelves. 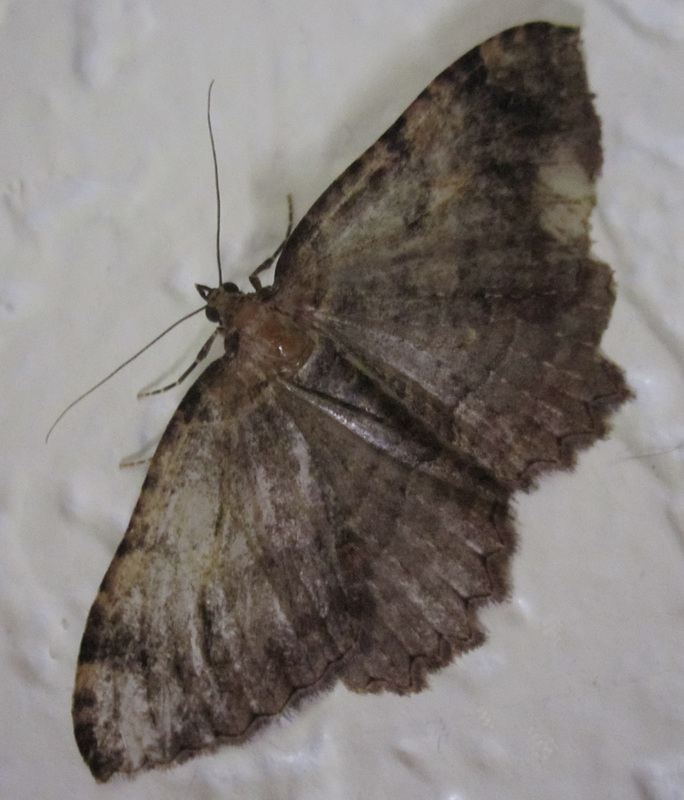 Then I began seeing this brown one on my white walls in the evenings, usually in a slightly different spot. Taking a close look, I could see ragged wing edges, and nearly translucent patches. This is a moth who has been around. There is another moth that lands on the computer screen in the mornings. Its wingspan is half an inch, and light shines through the veins and dusty patternings. I don’t know where it spends its days and nights, and I never see it flying. What sustains them? I welcome them in as wild creatures seeking shelter, and don’t begrudge them the heat and dry inside the house. They are non-demanding guests. How long will they stay? This afternoon I sat on the couch studying beekeeping books, wondering about providing supplemental nutrition to my overwintering colony. I’m sure they didn’t have time to store enough honey to keep them through till spring. They are fascinating bugs, and there is much to learn about their culture. I nodded off into a deeply satisfying nap. As I woke, I noticed something on the blanket and cried out when I found the brown moth. It had taken its last breath and released its hold on the wall, keeling over backwards. My question was answered–this one stayed until the end of its life. When I took the writing workshop in October, Lyanda Lynn Haupt offered a very short essay by Virginia Woolf as an example. You could say that an essay has a topic, but it’s really about something else. So it was with Woolf’s succinct elegant description of watching a moth in her study. It battered at the window trying to get out, yet she refrained from intervening. It fell to the windowsill, and again she refrained. She just observed the moth’s death. The essay was about the death of a moth, but really about the fragility of all life. Intervening would not have lengthened the life of Woolf’s moth, nor would it have improved the quality of its living. Same with the moth in my house. Sometimes it’s hard to let nature take its course, to look at death. Something inside resists the inevitable endings, hoping that this beautiful thing will always be with us. So I picked up the moth’s body, noticing the delicacy of the wings, the brittle amber body, the folded legs. It’s now on the windowsill by my drawing table, next to rocks from Spinola Creek and the Teanaway. The husk of a short-lived creature juxtaposed with pieces of old mountains that were once sea floors. Contrast and compare–life is both fragile and tenacious. I made sugar candy to give the bees, and sent away for some pollen supplement. They chose to stay, I choose to provide for them until they can provide for themselves. I wonder what else is sheltering here this winter? Cats and me, for certain. Spiders and earwigs, I suspect. Plants I have brought inside to keep alive till they can go out again in spring. What is ready to be complete? What new thing stirs? Creativity lies dormant in the roots of things, making its own way through the cycle of seasons. I really like this, Deb! You have me comparing your sheltered things to my sheltered things… but mostly you have me mulling “Creativity lying dormant in the roots of things”. Fun, thought sprouting read, Deb.